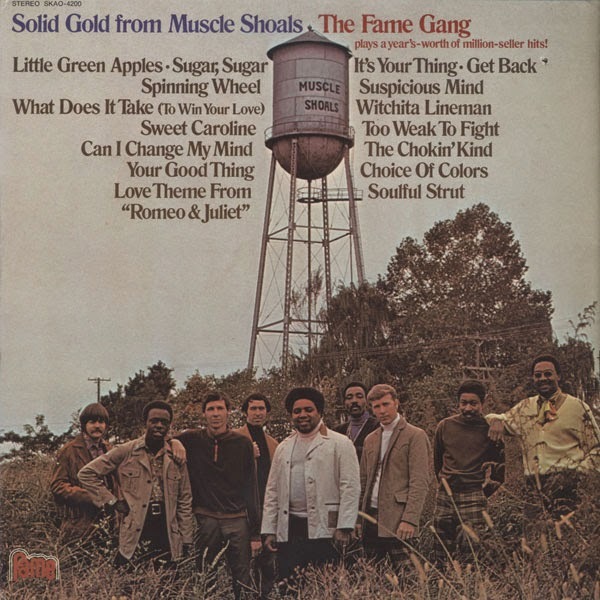 The Fame Gang was a group of studio musicians working at Rick Hall's Fame Studios. Fame Studios in Muscle Shoals, Alabama, was responsible for some of the best R&B and soul music of the 1960s, and one important factor in this was the team of talented musicians that called the studio their home and provided musical backing for all the singers who recorded there. Musicians who worked at Fame in the early days included Spooner Oldham, David Briggs, Norbert Putman and Jerry Carrigan. Over the decade most of them left for other things (for the most part in Memphis or Nashville), and in 1969 the rhythm section of Jimmy Johnson, Roger Hawkins, David Hood and Barry Beckett famously left to open their own studio across town (Muscle Shoals Sound Studio). This left owner Rick Hall needing to put together another group of studio musicians, which he did. The 'third Fame rhythm section' featured Junior Lower (guitar), Clayton Ivy (keyboards), Jesse Boyce (bass) and Freeman Brown (drums). Lowe had already been with Fame for most of the decade, and previously mostly played bass. Hall also managed to get himself a permanent horn section, consisting of Harrison Calloway (trumpet & trombone), Aaron Varnell (tenor & alto sax), Ronnie Eades (baritone sax) and Harvey Thompson (tenor sax and flute). This group went on to play on songs by Clarence Carter, Wilson Pickett, Etta James, Candi Staton, Bobbie Gentry, and many others. They also recorded an album by themselves as The Fame Gang. 1969's Solid Gold From Muscle Shoals featured instrumental readings of hits from the same year (plus a few from '68), produced and arranged by Mickey Buckins. The songs included numbers by The Impressions, Joe Simon, Glen Campbell, Neil Diamond, The Beatles, Elvis Presley, Blood, Sweat & Tears and others. Did you make it over to visit Muscle Shoals during your recent excursion to the US?? Just curious if that spurred on this latest post? ?